Another nail post. I decided to go for something a little more bright for the weekend. Both of these polishes are from the Essie Spring 2012 Collection. I picked up a set of mini polishes and I think this is the first time I've worn them since. 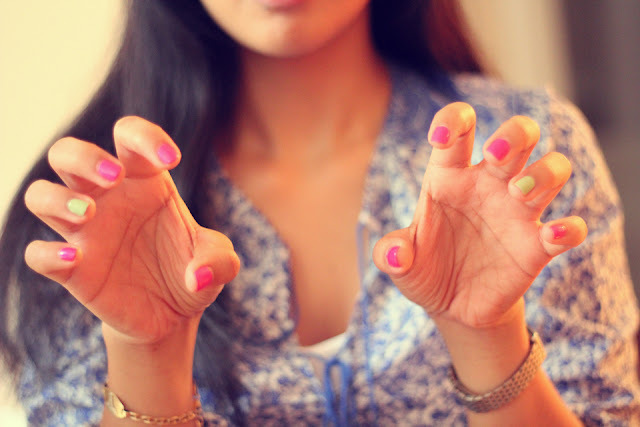 Essie Tour De Finance is a bright shimmery fuchsia, while Navigate Her is a pastel green. I love the pink and green combination. Both polishes applied beautifully, and like always, I topped it off with my favourite top coat from Sèche Vite. No chips so far! Hahaha, well, it's not the filter because there is none. It's just a combination of the lighting and a poor choice in white balance. So, it's just a terrible picture :).